here is an interesting reflection on what is clearly David Cameron’s failure to achieve any plausible or meaningful treaty changes on which to found his referendum, leaving him with his only hope, despite exploiting and abusing HMtQ to prop up his failing stance, he must now add Fudge to the efforts to swing the vote his way to the dishonest use of FUD (Fear, Uncertainty & Doubt). 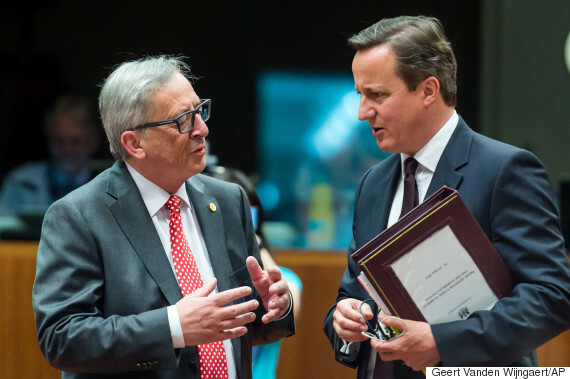 “It’s been a long night,” David Cameron said as the fraught EU summit dinner broke up just before 3am our time. But unlike other previous long nights (I remember when he emerged bleary eyed from his ‘veto moment’ in 2011), the PM was a mere palette cleanser amid the multi-course row over the Med migrant crisis. So Cameron’s long-awaited EU renegotiation statement started not with a bang but with a breather. When Donald Tusk turned to him to say a few words, one Brussels source said it was seen by other EU leaders as a ‘commercial break’ from the fractious row over migrant burden-sharing. After the asparagus, sea bream and strawberries, the PM made a ‘relatively brief’ intervention that gave some relief to colleagues exhausted by the exchanges. Cameron was greeted with silence, both during and after his short speech. At one point Italian PM Matteo Renzi yelled at Eastern European leaders refusing to take some of his migrants: “If you don’t agree with 40k, don’t deserve to be called Europe”. He later added: “If you want a voluntary agreement, you can cancel the whole thing, we’ll do it by ourselves.” One problem for Cameron is that the UK’s opt-out on the migrant deal doesn’t exactly endear him to a potential ally like Renzi on his renegotiation. And the wounds over the EU’s refusal to accept compulsory quotas are also a blow to Jean-Claude Juncker. After the plates were cleared, the PM said he was ‘delighted’ he’d started the process of his renegotiation, but Brits will worry that Juncker, not our best friend at the best of times, lacks the authority to sort a good deal on anything. The news from the summit that will irritate Eurosceptics most, of course, is No.10’s admission that there won’t be any Treaty change before the EU referendum. FCO sources have for some time warned that the most practical solution is to secure ‘binding’ protocols that will amend the Lisbon treaty at a later date. Nigel Farage and Hilary Benn today both used a line that Dan Hannan deployed weeks ago: that Cameron’s promised renegotiation will now amount to ‘post-dated cheques’ that could bounce. No10 insists that it can still get ‘legally binding and irreversible’ protocols. But the Guardian has perhaps the most worrying line for backbench Tories: senior UK officials say that some member states have said they cannot be expected to amend the Lisbon treaty on behalf of the UK, only to see it vote to leave the EU. Meanwhile, on the EU referendum front, it seems Farage didn’t take kindly to Her Majesty’s intervention on Wednesday. The UKIP leader says the Queen was ‘badly advised’ to warn against division in Europe. And new Defence Select chairman Julian Lewis has told The House magazine that further EU integration could even lead to war. No, really. It is unusual to see Nigel Farage making a moderated comment when a foolish outburst was such a potential, one can only assume his most recent series of crass of the cuff comments and brash out bursts, displaying not only a total lack of leadership skills but also that he is clearly losing control of his own feifdom and his dictatorial control of his Ukip cult as his party slides back to around 7% in the polls after a catastrophicly mismanaged election where although he garnered almost 4M votes by pandering to the known underbelly of racists voters he failed to make electoral gains – in fact losing one of his two MPs and clearly losing the support of his sole remaining MP and several of his MEPs. Indubitably he was right to comment that Her Majesty was ill advised to speak of fractures in Europe when firstly she meant the EU and secondly it is not her role to openly take up a political position. That The Queen spoke privately and her confidence was betrayed regarding the Scottish Region’s referendum is one thing, however to openly seek to influence a democratic vote amongst her subjects was doubly ill advised, both in the fact that she is a Constitutional Monarch with no righty or authority to make political interventions but also that she did so where there was no right of reply at a State Banquet in a foreign and very alien location.